So you're probably thinking, "Tom, are you crazy?" Even with more snow forecast tomorrow? Well, I went back through my photos of last year's activity, and let me just tell you that spring will be here soon. Soon we'll have a chorus of spring peepers across Ohio and the midwest. Megan and I shot this video of a single male spring peeper (Pseudacris cruicer) on March 18, 2007. The chorus of thousands of spring peepers can be deafening. Make sure you have your sound turned up when you watch the video- If it is hurting your ears, you are reliving the spring peeper chorus if full reality. 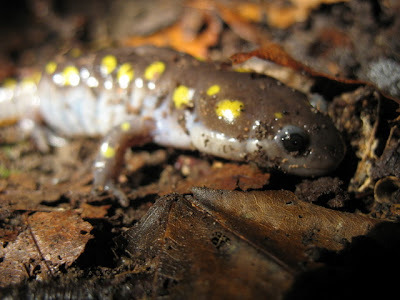 Yesterday I posted images of fine art, and today, I'm turning to my some of my favorite animals in Ohio, spring peepers and spotted salamanders (Ambystoma maculata). With the first warm spring rain, these tiny creatures emerge from their winter hiding places and head to temporary pools to breed. 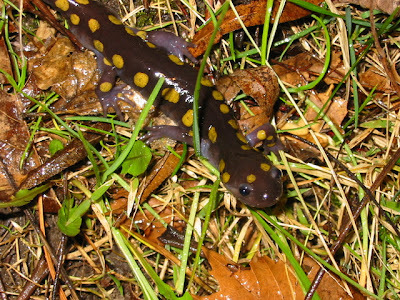 The spotted salamanders will return to the ground while the peepers stick around in wetlands, catching bugs and avoiding predators. 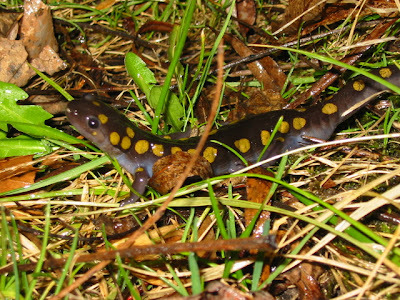 Spotted salamander from Portage County, Ohio, March 2007. Last year, Megan and I searched for spotted salamanders in Columbus, but only found the spring peepers heard in the viedo. Our second outing of the year turned up a few spotted salamanders, but me missed the mass migration. I have, however, witnessed this magical event one time in my life, when I was a graduate student at Miami University. My herpetology professor scheduled a field trip to a known salamander breeding pond. We were accompanied by another graduate student who had been visiting the pond for weeks, but had found no salamanders. We left the campus about 8:00 at night, arriving at the woodland pool soon after. Sure enough, when we got there, there was nothing but peepers. We searched, and searched, and searched the pond, but found no spotted salamanders. Finally, a drip here, a drip there- it began to rain. Would anything happen? Someone shouted out, "I found one!" I thought to myself, "really?" I thought they were full of B.S. And the shout came not from the pond, but from up on the hill. 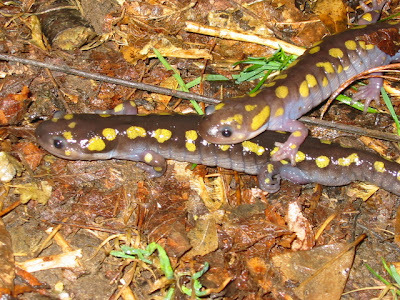 The class raced to the spot, and sure enough, in the leaves, was a magnificent 6 inch long spotted salamander. How cool! It continued to rain, and as we were gathered, another classmate "spotted" a spotted. Then another one. Then another one! After 10 minutes, we could barely walk in the woods without stepping one them. We collected 50 for the grad students project (he had a permit from the Ohio Division of Wildlife) but we could have collected hundreds. The most amazing thing about the whole night is how a quick change in environmental conditions caused these sallys to come out from underneath their hiding areas in the leaf little and logs. It was awesome. When I first saw these creatures in person, several things come to mind. First is their size- they are massive compared to the woodland plenthodonitid salamanders that I was more familiar with. Second- their color is spectacular. Incredibly spectacular for a creature that spends most of its time underground, and when it is above ground, it is during the night time. Third- If a poacher ever found a mass migration, look out. Hundreds if not thousands can be gathered at one time, and during one night, an entire population could be eliminated. I hope everyone gets to see an ambystomatid salamander (like the spotted) this spring! I never miss Salamander Night and last year our Mass Migration was much later than normal! I can't wait and shouldn't be too long before we all are out running around in the warm rain as everyone else is in there jammies! Thanks for sharing your awesome experience! It makes me think of the thousands of fiddler crabs clattering away on the stoney beaches of Long Island's north shore when I was young. Beautiful pix, too. I am always so excited to hear the first songs of the Spring Peepers, I know then that spring is here, great shots you have here Tom. The salamanders in Florida are all but gone. We don't know why. Could be armadillos (Archie Carr thought so). Could be fire ants. No one knows. I never saw a salamander mass march, but once during an all day rain in early summer I witnessed a mass march of gopher frogs (Rana areolata) headed towards a sandhill lake. This frog lives as a commensal with gopher tortoises (Gopherus polyphemus) in the latter's burrows. If you see 2 or 3 gopher frogs in a day, you're having a banner day. That day we saw maybe a hundred. Way cool! Nice peeper video!!!! I love it! I've heard them, but never spotted them at night. I can't believe he didn't even mind the bright light! Great job. These are rare around here either that or I have just never seen them. Nice photography. Tom- I viewed your post from last year, and what a sight! I've never witnessed the mating frenzy that you captured. Maybe Megan and I will get lucky this year! Lana- Fiddler crabs are very cool as well. I've seen them in South Carolina. Thank you, I'm glad you enjoyed this post. Boy- Interesting about the sallys in Florida. I'm actually heading down to Sanibel a week from Today and I hope to find and photograph several amphibian species! A gopher frog and or tortoise would be pie in the sky. Chris- These men frogs are so focused on pumping out there calls that they are often oblivious to most things once they get used to you. They really are fantastic little frogs. Abe- You might have tiger salamanders out your way. They do the same march, at night during the first warm spring rain. I'd love to see tiger salamanders this spring! I've never seen a spotted a salamander in the wiild! Maybe this year. It makes me think of your high school AP biology teacher, Mr. Stewart. I think he loved spotted salamanders, too. You ought to send this to him! I can't wait to hear the peepers in our pond. It really makes me think of spring, and it seems soo far away, with all the snow we STILL have! But today is March, and it's only 21 days... I'm so glad you're going to Florida! One week! I wish we could go too! You should get some GREAT pictures! That's very informative post. I'm just getting to know more about these creatures. Heck, I'm still struggling with birds! Hopefully March will go easy on us Midwesterners! That video of Spring Peepers was a real treat on this snowy first day of March. I'm in the Toledo area and I think it's going to be quite a while before I hear them in my neighborhood. Thank you. Mom-Thanks, you rock as a mom. I'm renting a really great lens to take on the trip, hopefully everything goes well. Dave- Here Here for a smooth spring. Unfortunately, warm days followed by freezing days always throws the salamander schedule way off. 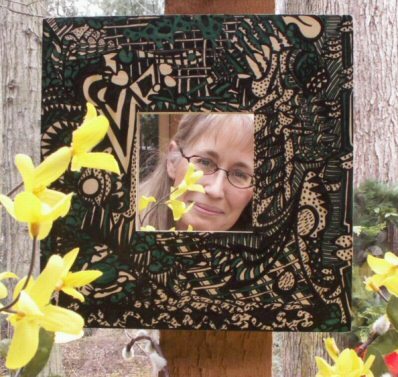 Birds, salamanders, bugs, I love it all! Looks like you have caught the biodiversity bug as well. Cathy- I'm glad you enjoyed the video. I hope to get better footage this year, and maybe even record mating activity of spotted salamanders like Mon@rch did last year. Everyone, have a great spring. Thanks for stopping by my blog and commenting!